An AdCode is a reference to a specific advertisement, usually a keyword or email campaign. It shows where visitors, customers, and orders originate. AmeriCommerce online stores uses AdCodes to track statistics on your advertising campaigns. 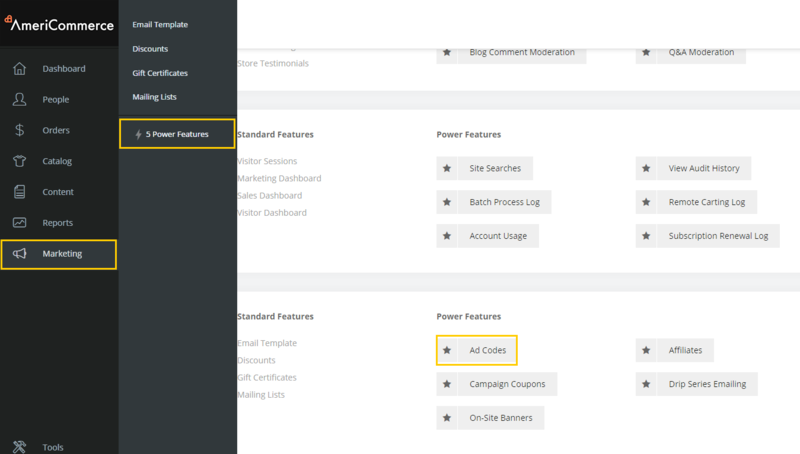 Campaign AdCodes can be set up under Marketing > Ad Codes. You need to create a unique identifier to name the campaign or referring source. In our example, EMNP12007 represents email/new product/December 2007. This detailed analysis lets you see which of your AdCodes are most effective. This saves you the money and time! To set an AdCode on a session for tracking purposes, append a=YourAdCodeHere to the querystring of the URL. If the AdCode does not exist, it creates automatically.